Much more than our state flower, the California Poppy has far more uses extending beyond providing color to our hillsides and grasslands. California poppy, or Eschscholzia californica, has many medicinal uses that nourish the nervous system and pain pathways providing relief to those suffering from anxiety, restlessness, disturbed sleep, headaches, chronic pain and more. Additionally, California poppy has been recognized on a mental, emotional, spiritual level for enhancing vitality and warmth surrounding the heart and providing self-acceptance and self-awareness for those who are often attracted to the glitz & glamour of others. Alkaloids from California poppy enhanced GABA binding to receptors inducing a calming effect similar to benzodiazepines. 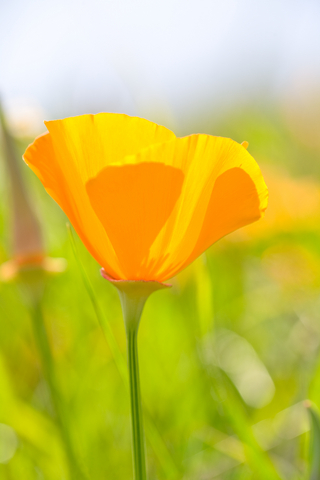 Sedative and anxiolytic (reducing anxiety) effects were observed after oral administration of California poppy. Liquid extracts of California poppy showed to reduce pain in mice peripherally. – Flower Essence Repertory by Patricia Kaminiski & Richard Katz.